Simpson was the youngest of seven sons born to David Simpson, a village baker, and was supposed to follow the same career. He was therefore apprenticed to his father, but spent his spare time working on scientific matters, and, thanks to a scholarship and help from his elder brother, he entered the arts classes of the University of Edinburgh in 1825, at the age of fourteen, an began the study of medicine in 1827. He studied under Robert Liston (1794-1847) and received his authorisation to practice medicine – licentiate of the Royal College of Surgeons of Edinburgh – in 1830. He was then 19 years old and subsequently worked for some time as a village physician in Inverkop on Clyde. Two years later he returned to Edinburgh where he received his medical doctorate in 1832. 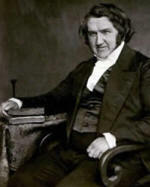 The professor of pathology, John Thomson (1765-1846) entrusted him with some lectures, and in 1835 he was made senior president of the Royal Medical Society of Edinburgh. He was appointed to a Chair of Midwifery at the same institution in 1840, quickly establishing the position of this subject as a popular and essential part of medical education. He was a pioneer in the use of anaesthetics, particularly chloroform, developing its use in surgery and midwifery. He introduced ether to obstetric practice in 1847, but in a search for something better, Simpson tried different anaesthetic agents with his colleagues by inhaling their vapours around the dinner table at his home. He championed the use of chloroform against medical, moral and religious opposition. It was not until Queen Victoria used this anaesthetic during the birth of Prince Leopold (1853) that its use became generally accepted. Simpson also pioneered obstetric techniques and responsible for much reform of hospital practice while working at the Infirmary in Edinburgh. In 1866 Simpson became the first person to be knighted for services to medicine. Simpson is buried in Warriston Cemetery (Edinburgh). Around 1700 medical colleagues and public figures joined his funeral procession and more than 100,000 people lined the route to the cemetery. He is remembered by the Simpson Memorial Maternity Pavilion in Edinburgh, together with a statue in Princes Street Gardens and a bust in Westminster Abbey (London).